Following Saturday’s mass shooting at the Tree of Life Synagogue in Pittsburgh, Manhattan Beach resident Charlie Raker reached out to his uncle Martin, who lives in New York City and is a survivor of the Auschwitz concentration camp. His uncle, in turn, pointed to a story he had recounted in his memoir. When they were being sent to Auschwitz, his uncle’s father had said to Martin that, if Martin survived, he had to honor his ancestors the only way he could: keep on living. 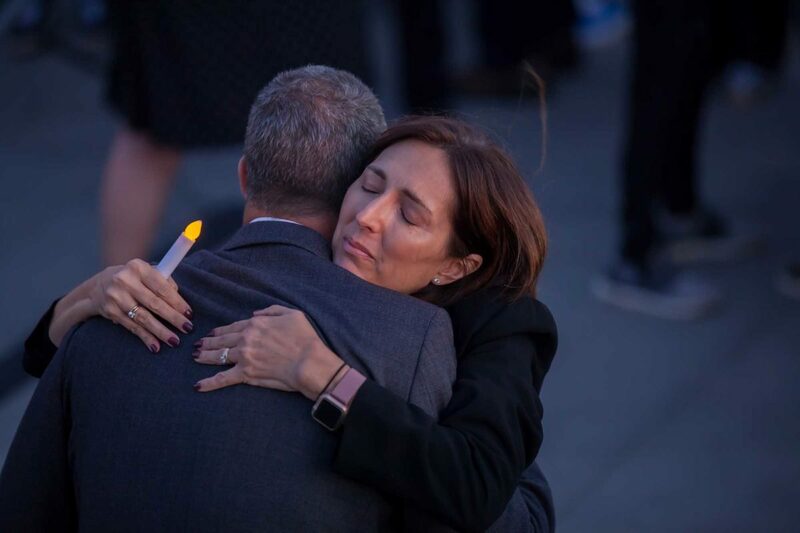 Raker related the story at the foot of the Manhattan Beach Pier Monday night in an emotional candlelit vigil prompted by the shooting, in which suspect Robert Bowers is accused of killing 11 people. The impromptu ceremony came together after local religious leaders reached out to city officials, and hundreds of people gathered to sing, light candles and attempt to regroup from what authorities say was a homicidal attack fueled by anti-Semitism. Bowers posted anti-Semitic rants on social media shortly before entering the synagogue, authorities said, underscoring the simple but dark truth at the heart of Raker’s comments to open the vigil: “Hatred of Jews is real,” he said, several times. Mayor Steve Napolitano was joined by fellow city council members, MBUSD Superintendent Mike Matthews, and Assemblymember Al Muratsuchi. He told those gathered that, although they had to recognize the horror of what had transpired, they could not let it prevent them from going on with their lives. The best way to prevent hate-fueled violence, Napolitano said, was to demonstrate that “kindness is strength,” and led the crowd in a chant of resilience. “Say it again, because that was not nearly loud enough: We are not afraid,” he said. Various leaders of different faiths in the South Bay were also gathered, to provide a spiritual counterpart to the guidance of elected officials. Rabbi Yossi Mintz of the Jewish Community Center pointed out that next week marked the 80th anniversary of Kristallnacht, considered the beginning of the Holocaust. But instead of despair, he and others urged those gathered to focus on ways to bring the community together to prevent these tragedies from recurring. Alluding to the 11 candles, one for each of the deceased, that he would later ask children in the audience to light, Mintz said that one person could make a difference. “Even one light has the power to evaporate darkness,” Mintz said.